Circe, the witch who turns Odysseus’ men to pigs, has proved one of Homer’s most memorable creations. We first meet the goddess in book 10 of the Odyssey, living on her lush, deserted island of Aiaia, surrounded by tame wolves and lions. When Odysseus’ ship lands on her shore, she gives the crew wine mixed with spell-drugs, then transforms them to pigs. When Odysseus comes to rescue them, she attempts to give him the same potion, but he is protected by magical herbs, courtesy of Hermes. Circe and Odysseus become lovers, and Odysseus and his men (returned to their regular shape) dally in luxury on her island for a year. 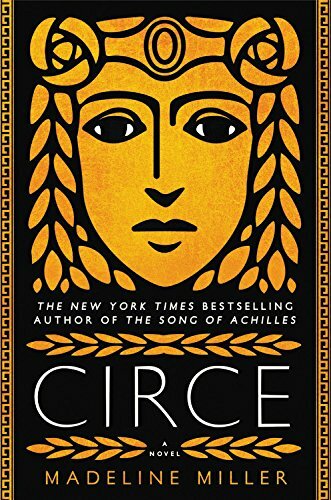 It is no surprise, given such a vivid story, that Circe has proved irresistible to generations of artists. Below is a sample of the many faces our favorite witch has worn over the millennia. 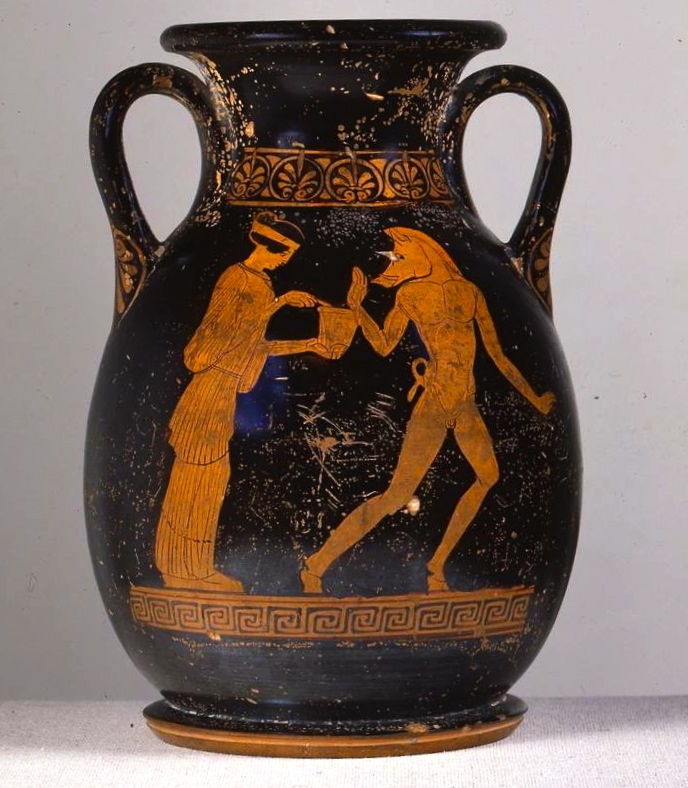 Circe and one of Odysseus’ transformed men, Athenian pelike, circa 5th century B.C.E. Staatliche Kunstammlungen Dresden. Circe transforming Odysseus’ men to pigs has proved a favorite theme in both the ancient and modern world. In classical depictions it is typical for the men to have the heads of animals and the bodies of men (even though in Homer they are described as being completely pigs). The half-and-half shape helps the artist evoke the man trapped inside the animal, highlighting the monstrousness of Circe’s spell. 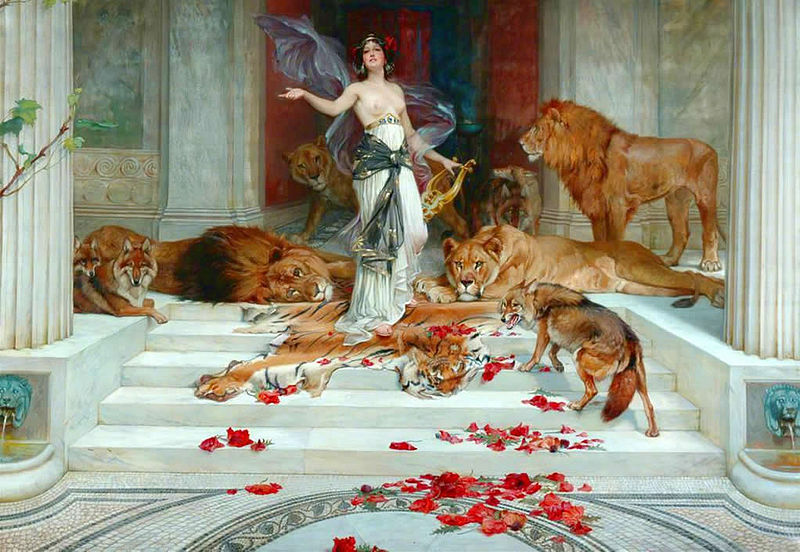 An incredible painting of a powerful Circe, surrounded by realistic animals. I particularly love the poppies scattered on the marble steps, which at first glance look like blood. Artists from the Renaissance onward almost uniformly cast Circe as a classic romantic, pre-raphaelite type, with unnaturally white skin and often reddish hair, as you will see throughout. Just to be clear: this is not a traditional ancient look! Circe Invidiosa (Jealous Circe), John Waterhouse, 1892. Artists adored the femme fatale aspect of Circe, and this is one of my favorites of that type. I love the look on Circe’s face: utterly focused rage. The scene it illustrates comes not from Homer but from Ovid’s Metamorphoses. The sea-god Glaucos has fallen in love with the nymph Scylla, but cannot get her to love him in return. He goes to Circe for a love potion, and instead the witch falls in love with him. When he spurns her, Circe gets her vengeance by turning Scylla into the hideous six-headed monster we know from the Odyssey. In order to effect the transformation, Circe goes to Scylla’s favorite bathing spot and taints the water with her drugs—which is the moment Waterhouse captures. Also, check out the amazing catfish creature she’s standing on. The Kingdom of the Sorceress Circe, Angelo Caroselli and Pseudo-Caroselli, c. 1630. Ottocento Art Gallery. I had to include this one, if only for the grumpy Louis XVI lion. Since her creation, Circe has embodied male anxiety about female power. This painting takes that anxiety to an extreme: Circe doesn’t just change men, she strews her island with their bloody body parts. 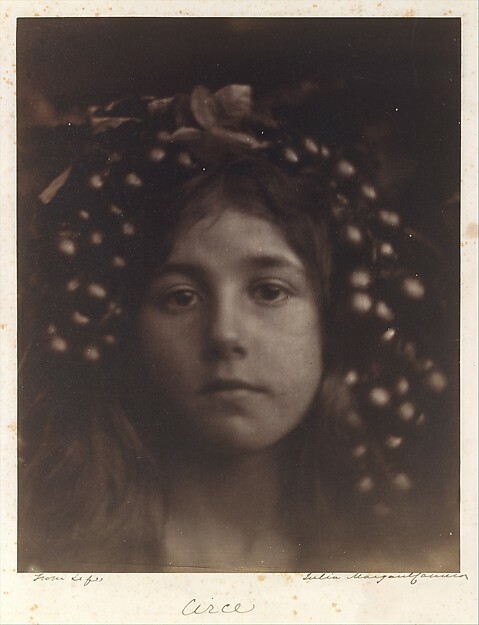 Circe, by Julia Margaret Cameron, 1865. Metropolitan Museum of Art. A photographic portrait of a young woman as Circe. I find this completely arresting. This is one of the few pre-contemporary depictions of Circe I could find created by a female artist. We see none of Circe’s menace here. Her expression is poised, calm and enigmatic. If anything I catch a touch of grief in it. Illustration from a German edition of Boccacio’s De Mulieribus Claris, printed by Johannes Zainer, ca late 15th century. Literae Humaniores collection of the University of Pennsylvania Library. I always appreciate my Greek myths dressed in full medieval courtier style. The unchanged man is Odysseus (marked with his Roman name, Ulysses). 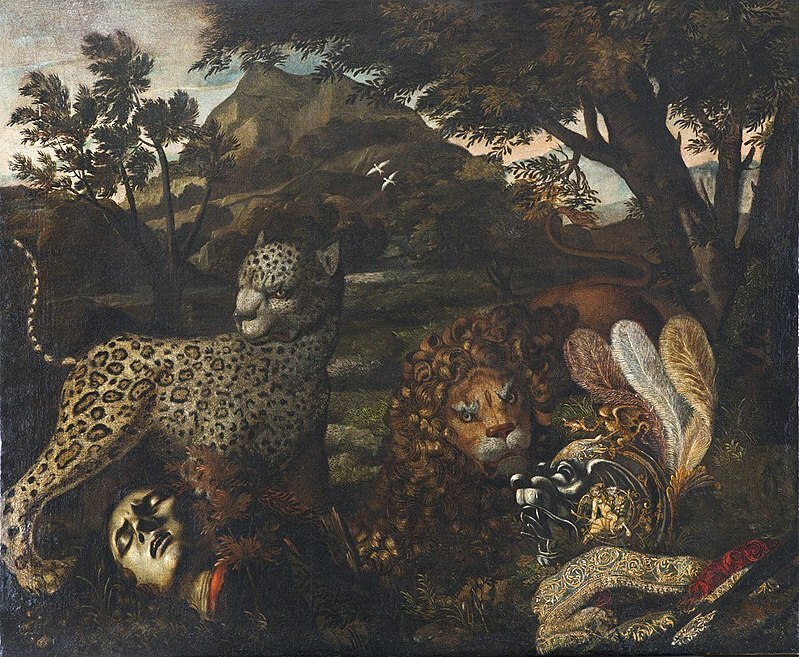 The lion-headed man is likely meant to be one of Circe’s tame lions. 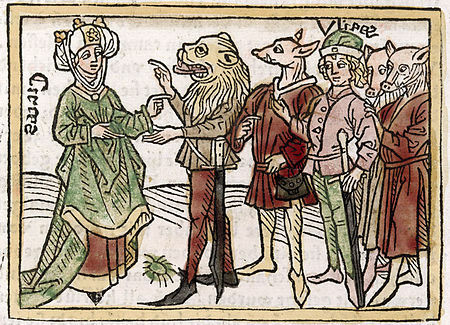 Scholars have debated whether Circe’s pet lions are supposed to be transformed men, or merely tamed beasts. In my novel, I chose to make them actual animals, because I wanted to honor Circe’s connection to Eastern and Anatolian goddesses like Cybele. Such goddesses also had power over fierce animals, and are known by the title Potnia Theron, Mistress of the Beasts. 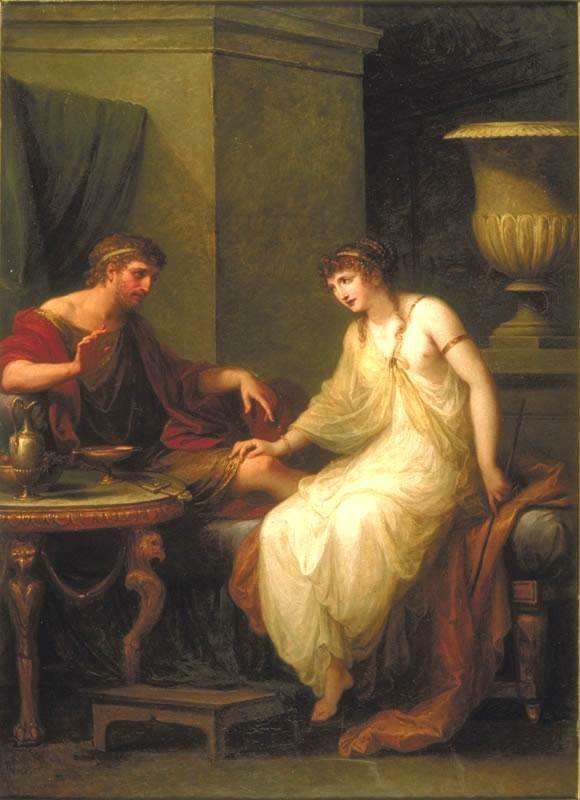 In the background, Hermes is counseling an agitated Odysseus on how to escape Circe’s spells. 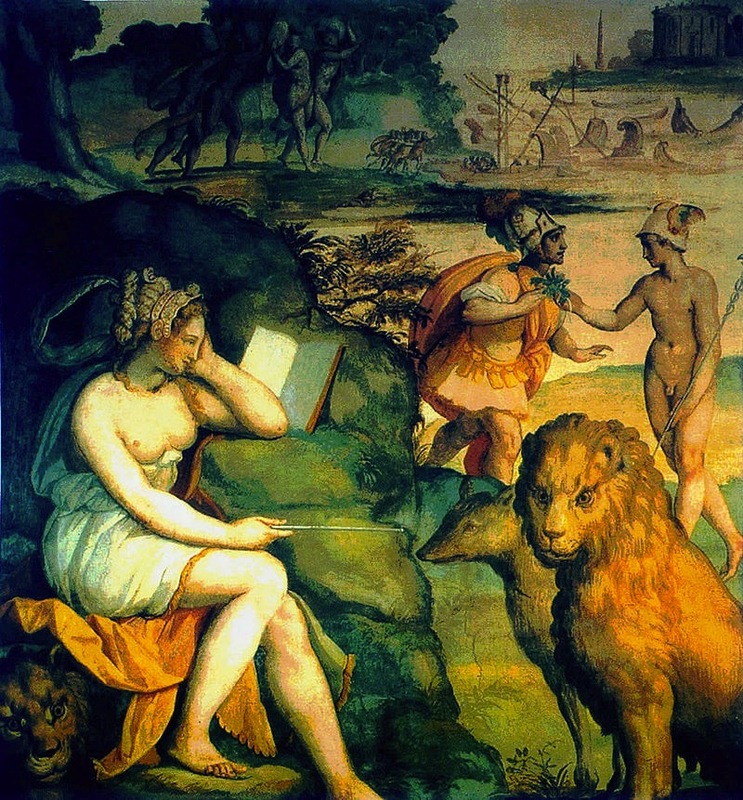 In the foreground, Circe relaxes with her wand, animals, and a good book. Pasiphae and the Minotaur, ca 330 B.C.E. National Library of France. Circe’s sister is the Queen of Crete and the mother of the Minotaur. 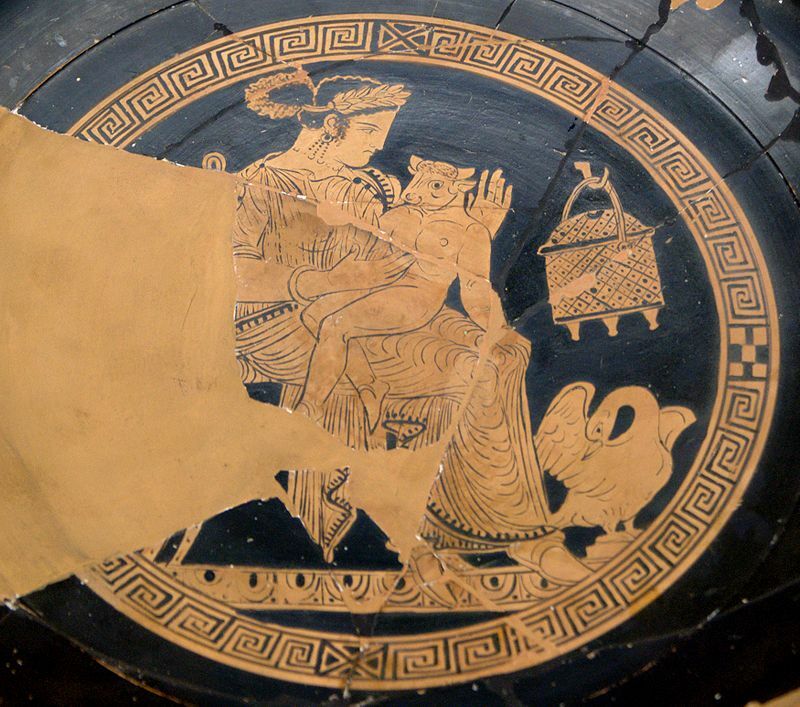 I had to put it in both because I love the depiction—maternal Pasiphae dandling her monstrous child on her knee—but also because Pasiphae was one of my favorite characters to write in the novel. Without getting into too many spoilers, I will say: how many times in a life do you get to mid-wife a minotaur birth? Ulysses and Circe, Angelica Kauffmann, 1786. Another female artist. It’s difficult to decipher exactly which moment this is supposed to be. At first, I took it for an unusual depiction of a benevolent Circe, which focuses on the easy intimacy between her and Odysseus, and the comfort she ends up giving him. But she’s holding her wand low in her left hand, as if to keep it hidden from him… so it’s hard to say. Circe, by John Collier, 1885. Just a woman lounging naked with her tiger. (#goals). 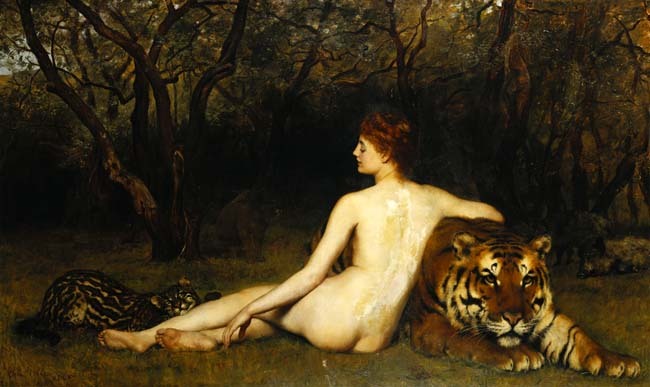 If tigers had ever been native to Greece, I’m sure Circe would have had one. Another ancient depiction of Circe, capturing the moment that Odysseus turns the tables on her, drawing his sword. For me it has an almost farcical energy. The men-turned-pigs running around, Odysseus pursuing Circe, who flees, having just hastily hurled aside her tainted wine and wand. 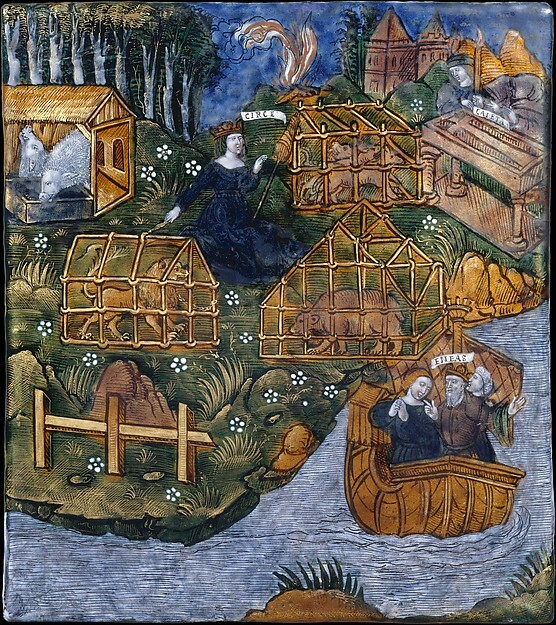 Aeneas Erects a Tomb to his Nurse, Caieta, and Flees the Country of Circe (Aeneid VII), The Master of the Aeneid, c. 1530-35. Metropolitan Museum of Art. This is an illustration of an episode from Vergil’s Aeneid, the epic poem which tells the story of the Trojan hero Aeneas fleeing the ruins of Troy to found a new civilization in Italy—the future Roman Empire. On his way to Italy, he must sail by Circe’s island, a scene which Vergil conjures with visceral horror movie build-up: the smell of Circe’s cedar fire, the sound of her singing as she weaves at her loom—overlaid with the screams of transformed men trapped by her magic. This picture unfortunately doesn’t quite live up to Vergil. It looks more like Circe has opened up a zoo. 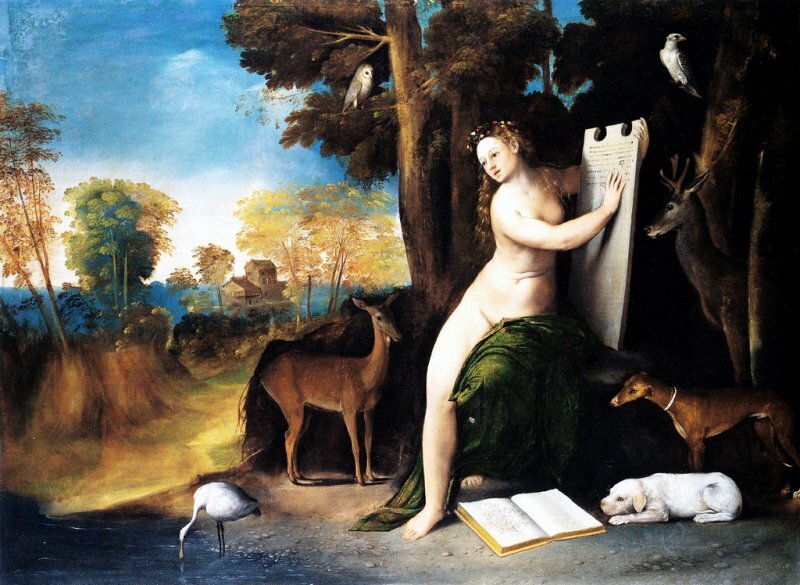 Circe and Her Lovers in a Landscape, Dosso Dossi, ca. 1525. National Gallery of Art, Washington D.C. This painting is inspired by later myths about Circe, which depicted her as perpetually unlucky in love, always falling for a man who rejects her, then lashing out in vengeance. In his Metamorphoses, Ovid tells a typical version: Circe falls in love with the hero Picus. When he spurns her, she turns him into a woodpecker. The title seems to imply that all the animals we see here were former loves, which Circe has made into a personal menagerie. Which she is now teaching to read? Ulysses at the Palace of Circe, 1667, by Wilhelm Schubert van Ehrenberg, animals by Carl Borromäus Andreas Ruthart, J. Paul Getty Museum. These artists have taken the lush, seductive atmosphere of the original Circe story and run with it. 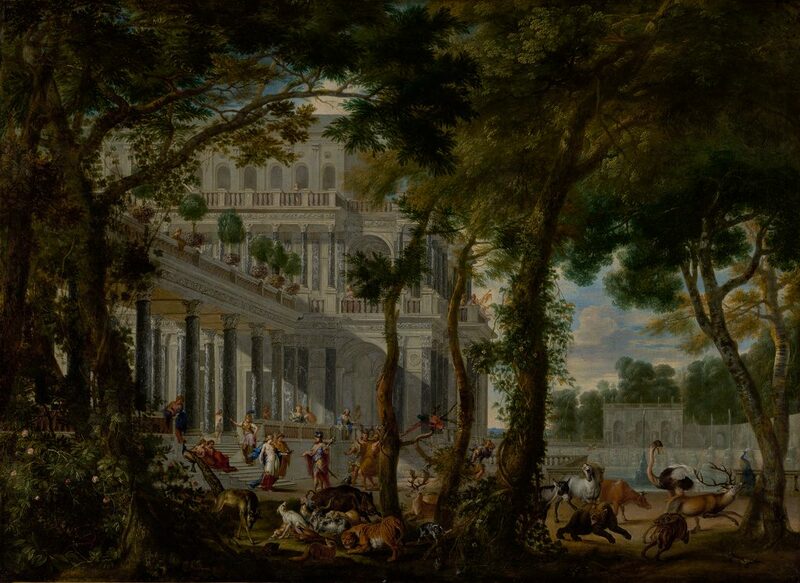 Now Circe lives in a Versailles-extravagant house, surrounded by a louche entourage, and exotic animals, including an ostrich (!). Aiaia is obviously the place to party. Circe Offering the Cup to Odysseus, John Waterhouse, 1891. Another Waterhouse interpretation. It captures Circe in the moment of offering the drugged cup to Odysseus, who is reflected in the mirror behind her. I love the contrast of the two: Circe’s certainty, and Odysseus’ tentative approach. In the story, we know that this power dynamic is about to be flipped. Circe’s spell fails, Odysseus draws his sword, and Circe yields, kneeling at his feet. 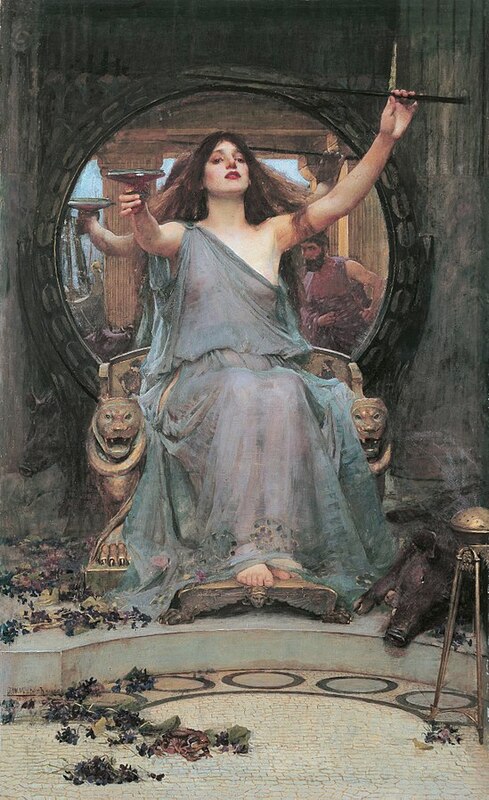 But Waterhouse lingers instead on the moment of Circe’s power, capturing her magnetism and imperious mystery. My favorite depiction of Circe. The original cast of this statuette was a stunning six feet tall. Its elegant, spare composition focuses on two things: Circe’s female body, drawn lushly naked, and her power. Mackennal gives us a Circe that is mid-spell, intent on her work. The object of her spell is unknown. Odysseus, pigs, pleading men, magic wand, potions, all are swept aside. Instead there is only Circe herself, in the center of the scene. Just where she should be.